If you can’t house your aquatic turtles outdoors in a pond due to your local climate or that they are still small juveniles, you can keep them indoors in an aquarium. With that said, the best indoor habitat for your little pets is a custom built turtle table with a built in water feature. If you can manage to build one of these, your turtles will be better off. The reason being, is that the glass fish tank makes it hard to create temperature variations. The glass of an aquarium will absorb, reflect and transfer the heat all throughout the tank which can lead to a very warm living space. For those turtles that like to bask in warmer temperatures, it might be difficult to keep the basking temperatures from raising the temperatures of the rest of the living space to unhealthy levels. However, you can prevent this by not placing a hood cover onto the tank. This helps circulate the air in the tank and allows some of the heat to escape. In addition, proper ventilation is an important part of keeping a turtle from getting sick. If it’s possible, you should try to find an aquarium that has lower walls and wider length and width dimensions than that of a traditional fish tank; often called breeder or long tanks. This too will help circulate more oxygen and regulate temperatures. See below for the minimum requirements of your tank. Each aquatic turtle breed varies in the size it will reach at maturity and so each will require a different minimum size tank. The best solution is to always get a tank that is bigger than they need at the time you buy them. It can become expensive to have to upgrade your tank as they grow. If you buy a tank they can grow into, the cheaper it should be in the long run. If space is and issue, you should stick to turtle breeds that don’t grow large. The red eared slider can grow up to a foot but certain types of mud and musk turtles only grow to about 5 inches. Min Length: The tank should be 4-5 times longer than the length of your largest turtle. Water Depth: The depth needs to be at least 1.5 times deeper than the length of the turtle. Note: The water needs to be deep enough so if a turtle falls in upside down, it has enough depth to flip itself back over. If it sinks to the bottom while upside down and its feet out of the water, it will likely be drowned. Likewise, if the water depth is too shallow, the turtle can harm itself if it dives in and hits the bottom. Using these minimum dimensions, if you have a 5 inch (13cm) long turtle you should get a tank that is 20-25″ L x 15-20″ W (50-64cm x 38-51cm) with a water depth of at least 8″ (20cm) deep. For a 10 inch (25cm) long turtle, you need a tank that is at least 40-50″ L x 30-40″ W (101-127cm x 76-101cm) and a water depth of about 15″ inches (38cm). For each additional turtle in the tank, add 25% to those dimensions. If you keep your turtles indoors, you will need to supply them with supplemental lighting that contains ultra violet A and B light; the same as what the sun produces. This type of lighting is essential to a healthy turtles. It’s important to note that the lights that provide ultra violet light won’t work if the light has to go through a piece plastic or glass before it gets to the turtle. There are several types of lights that you can use in combination with each other. These lights should be on during daylight hours and off during the night. Setup your lights on a timer and set the on off cycle just as it is where your turtle originates from. One type of light you can use is an incandescent bulb and the other is a fluorescent bulb. The lights should you get will depend on the needs of your turtles. Not every aquatic turtle likes to bask and not everyone likes bright lights. If you don’t know what your pet likes, take a look at our section on turtle living requirements. If that section still doesn’t answer all your questions about the needs of your turtles, see our information on aquatic water turtles species or go off of what conditions your turtle would have in its natural habitat. Tropical species for example, probably don’t like a lot of bright but do enjoy warming themselves in a basking area. This is why you might decide to use a combination of low level lights and different solution for providing heat. Most houses, especially in the winter months don’t have an air temperature that your turtles will thrive in. This means you will need to supply them with a source of heat. An incandescent light won’t be sufficient enough since you will need to turn that off during the night time hours or you might not want to use one at all if your turtles don’t like the bright light. 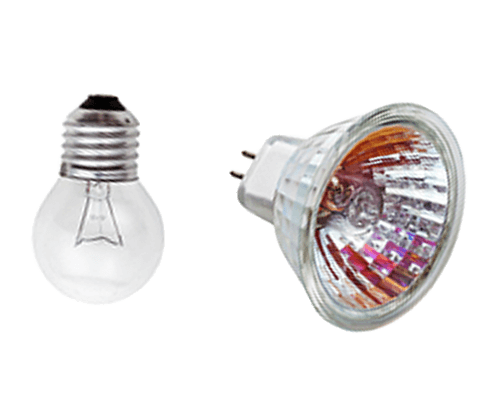 In these cases, you can use a ceramic infrared bulb. these bulbs only produce heat and produce no light; perfect for night time hours. Get one with a ceramic socket so it lasts longer and hang it about 16-18 inches above the tank. don’t let it rest on any surfaces that could catch on fire. Additionally, you can use heat pads that you can place directly under the turtle tank. There are two types of heating pads that you can use. The first is a flat sheets with flat heating elements. It can be secured directly on the underside of the tank. These work best on glass tanks and should be avoided being used on any plastics that can melt. The other type of pad is called a pig blanket. It is thicker and has heating elements embedded inside. They can usually be used under any type of tank. Either heating pad option you choose should first be tested for temperature by adding a thermometer. An easy option to heat your turtles tank water is to use a standard in tank aquarium heater that has suction cups that can be secured to the side of the glass walls. If you have active turtles you should wall off the heater or place it in a clay pipe. This will keep the heater protected from being knocked around by your turtles and it will keep the turtles from being burned by the heating elements. By adding a filter that forces water through the clay pipe, it will help circulate the warm water. Add a thermometer to make sure your turtle’s water is always at the optimal temperature range. Clean water is vital to keeping your aquatic turtles healthy. They use their water as a drinking source, a place to cool off and as a bathroom. Turtles will dirty up their water fast if there is no filtration. Water parameters that you need to be concerned with include: proper water temp, well oxygenated, neutral pH levels, low ammonia and nitrate levels and the absence of chlorine or other toxins in the water. Test kits are available to test for all of these factors and there are products that will help remove or adjust water parameter levels that are off. There are several filter options to choose from and it really comes down to how much you want to spend and the available space you have. In tank filters that fish tank owners use are often cheaper than out of tank canister filters but can get beat up by your active turtles. Whatever options you choose, you should consider getting a filter that has a mechanical and biological filter. A mechanical filter helps remove particle and waste in the water while a biological filter consists of beneficial bacteria that helps remove toxins from the water like ammonia. While aquatic water turtles spend a lot of time in the water, they do need a way to get out of the water and rest or bask. For this reason you will need to provide some sort of land area. The size of the land area will depend on the breed of your turtle. This could mean that for highly aquatic breeds you could place a few flat rocks that rise out of the water or even a log, piece of driftwood or floating cork bark that the turtles can climb up out of the water and rest on. Semi aquatic species on the other hand would do best with a larger land area. A better option than logs and rocks is to section off a portion of your tank and create a land area with substrate. If you have a glass aquarium, you can create this by using an aquarium sealant to section off an end of the tank with a properly sized piece of glass or plastic. Make sure the top portion of the glass is not sharp though. If you have a plastic tank like a storage bin, aquarium sealant most likely won’t seal to the flexible plastic walls. You might be successful with a smaller bin to inside the larger one. A great alternative to the options above is a turtle topper. It’s a addition that can be placed directly onto the top of an aquarium with a ramp that allows the turtles to climb up out of the water and into a basking area. By placing the basking area on top, you maximize the water area and increase your tank’s overall square footage. If you are handy you might be able to build your own topper but make sure you don’t use any materials that could hurt your turtle. Avoid using metal rung ladders or anything your turtle’s feet might get stuck in. Some people recommend not using any substrate on the bottom of their tanks since it makes it easier to maintain and this is perfectly fine but it doesn’t look nice. Why not add a layer of gravel, sand or silt to make your tank look more natural and resemble your turtle’s natural habitat. In terms of the out of water land area, you can use a loose mix of sand and soil, coconut fibers or ground bark from fir trees.